Iru Mugan is a 2016 Indian Tamil language science fiction action thriller film written and directed by Anand Shankar. The film stars Vikram in dual roles , Nayantara and Nithya Menen in the lead roles, while Nassar, Thambi Ramaiah, Karunkaran and Read More.. Description Iru Mugan is a 2016 Indian Tamil language science fiction action thriller film written and directed by Anand Shankar. The film stars Vikram in dual roles , Nayantara and Nithya Menen in the lead roles, while Nassar, Thambi Ramaiah, Karunkaran and Riythvika appear in supporting roles. Having gone through several changes in pre-production of cast and producers, the film began shooting in December 2015. The film was simultaneously dubbed into Telugu as Inkokkadu and was released worldwide on 8 September 2016. Iru Mugan received positive reviews from critics and became one of the highest grossing Tamil films of 2016. 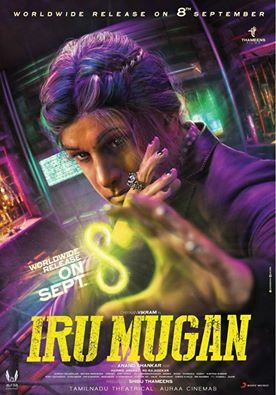 Iru Mugan is a 2016 Indian Tamil language science fiction action thriller film written and directed by Anand Shankar. The film stars Vikram in dual roles , Nayantara and Nithya Menen in the lead roles, while Nassar, Thambi Ramaiah, Karunkaran and Riythvika appear in supporting roles. Having gone through several changes in pre-production of cast and producers, the film began shooting in December 2015. The film was simultaneously dubbed into Telugu as Inkokkadu and was released worldwide on 8 September 2016. Iru Mugan received positive reviews from critics and became one of the highest grossing Tamil films of 2016. No reviews available for #IruMugan, Do you know Iru Mugan?, Please add your review and spread the good things. An action crime based on drug mafia and illegal pharmaceutical supplies, headed an international mafia named Love, played by Vikram. Vikram also dons the role of RAW agent where his mission is to indentify and eliminate Love. Overall the movie boasts of briliiant stunt sequences, however, the plot fails to keep the audience engaged. Nayantara's role seemed a little hype to the movie and could have been better avoided. Another example of Indian movie where songs have been unneccessarily fitted into the plot. In short, Iru Mugan is worth a watch once.